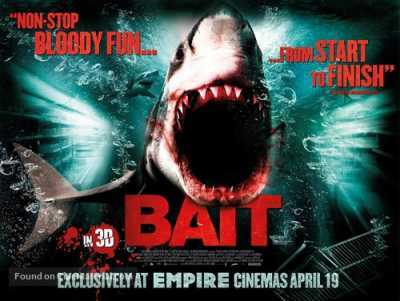 Bait is an Australian-Singaporean horror disaster film directed by Kimble Rendall based on the screenplay by John Kim and Russell Mulcahy. It featured Sharni Vinson, Phoebe Tonkin, Xavier Samuel, Julian McMahon, Cariba Heine, Alex Russell, Lincoln Lewis, Alice Parkinson, and Dan Wyllie. The film was released on 20 September 2012 in Australia. The movie opens with a hungover lifeguard, Josh (Xavier Samuel) being woken up by friend and fellow lifeguard Rory (Richard Brancatisano). Rory tells Josh that he shouldn’t have proposed to his sister, Tina (Sharni Vinson) then offers to set a buoy for Josh. Josh visits Tina, who discusses their upcoming move to Singapore.